It's Monday today, but I had to stay at home from work with Albin, who has caught a cold. It's always like this - two weeks into the school term the bugs attack, and someone gets ill. 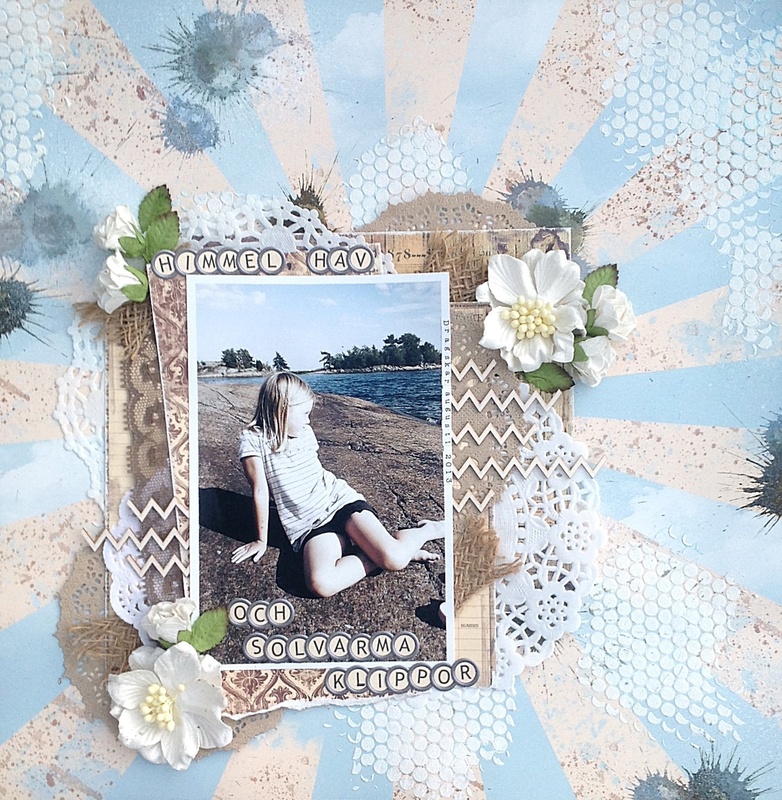 I have a layout to share today with the Fall Flea Market collection from Riddersholm Design. The photo is from this summer, and the days we spent in a rented beach house in Småland. The weather was perfect those days, and we spent a lot of time hanging out on the cliffs by the sea. I sometimes wish I had a house like that, on the beach, to spend warm summer days in. Actually, we do have a piece of land stretching down to the shore, and one day, I hope to be able to open up the woods out there just a little bit, and build myself a tiny cabin with a sea-view, and a path leading out to the little island that is part of our property. I know there are tons of rules and regulations that most likely will stop this from happening, but still... I might just park a litte vintage camper out there to use as a beach shack. I don't think anyone can stop me from doing that. OK, enough with the dreaming, and let's just get back to the layout. I totally adore this sunburst paper from Riddersholm design, and the best thing is that I have it in both 12X12" and 6X6", so I can use it a lot... You will se a card with it in a few days.